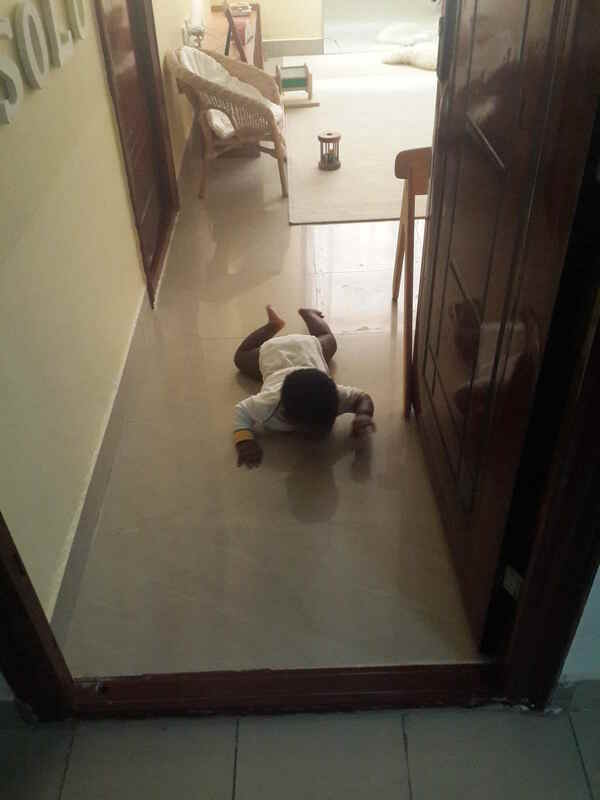 Once my son started slithering, he would find his way out of his room and try to find us. He started spending more time in the living room and so we set up another shelf for him in the living room. Around this time, we started the weaning process and he was also sitting comfortably. We would put him in front of the shelf and let him play. There were usually two to three items in the cubbies. A treasure basket and another one or two items. The red ball stayed on top of the shelf. New areas created in the living room. You can see the independence in these pictures. Moved from the blanket to the shelf and when he was done he came to us. These pictures were taken over 47 minutes. 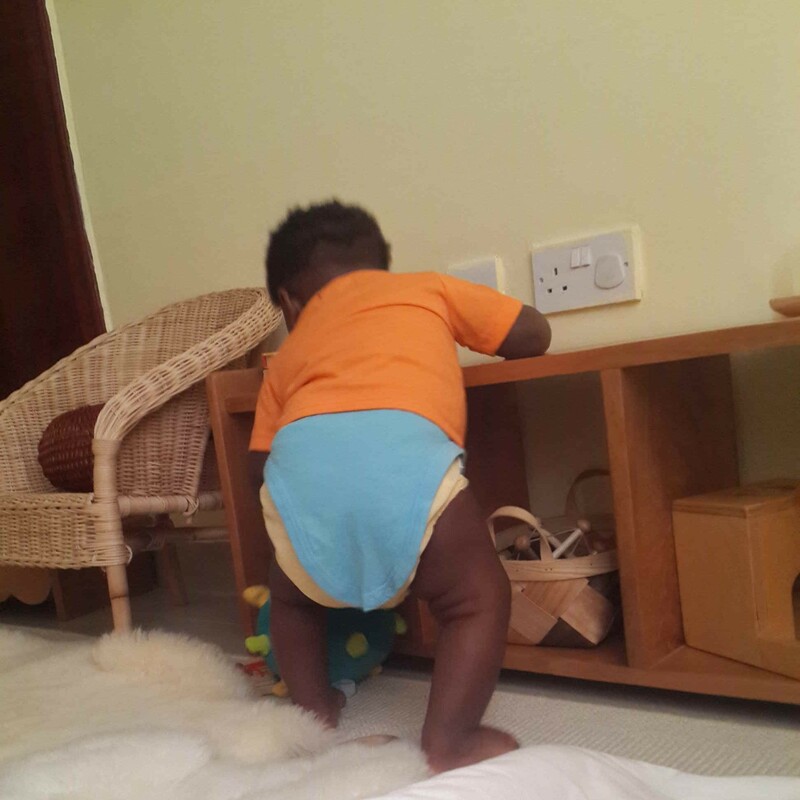 Note: Once he started pulling up (same week) he never went back to the blanket and preferred to stay by his shelf so that area was removed. 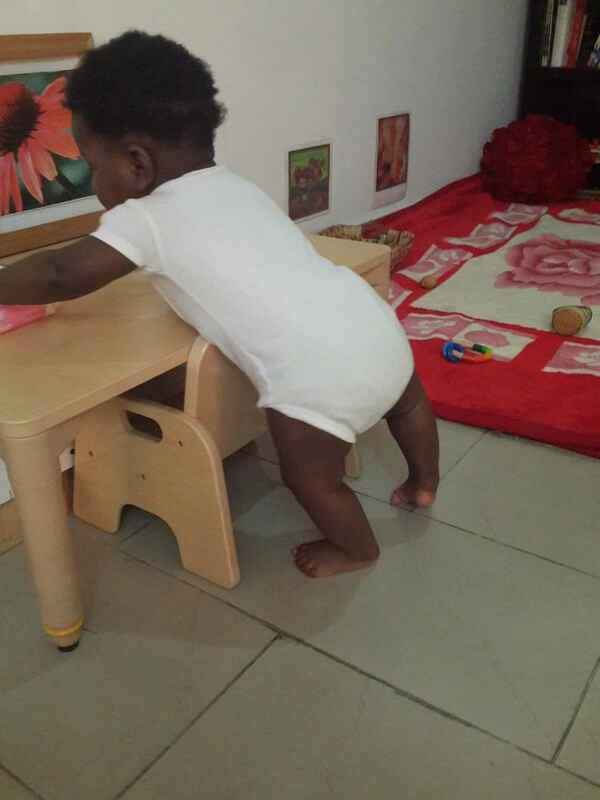 The first time he tried pulling up was at the weaning table. He’s definitely more adventurous when there’s a trusted adult close by. Once he tried it at the weaning table once, it was like he realized he was able to do it. The next day I looked up and he had crawled from his play area to the table again and pulled up. I have to tell you it scared me because I wasn’t sure he knew how to sit back down without falling or letting go. I tried not to over react but went close enough to help if needed. He bent his knee before letting go and sat down. Ah! I am glad I did not try to help… I should trust more. Anyways this is about shelves! I shouldn’t get distracted. Once he tried those two times at the weaning table, he started pulling up at his shelf. 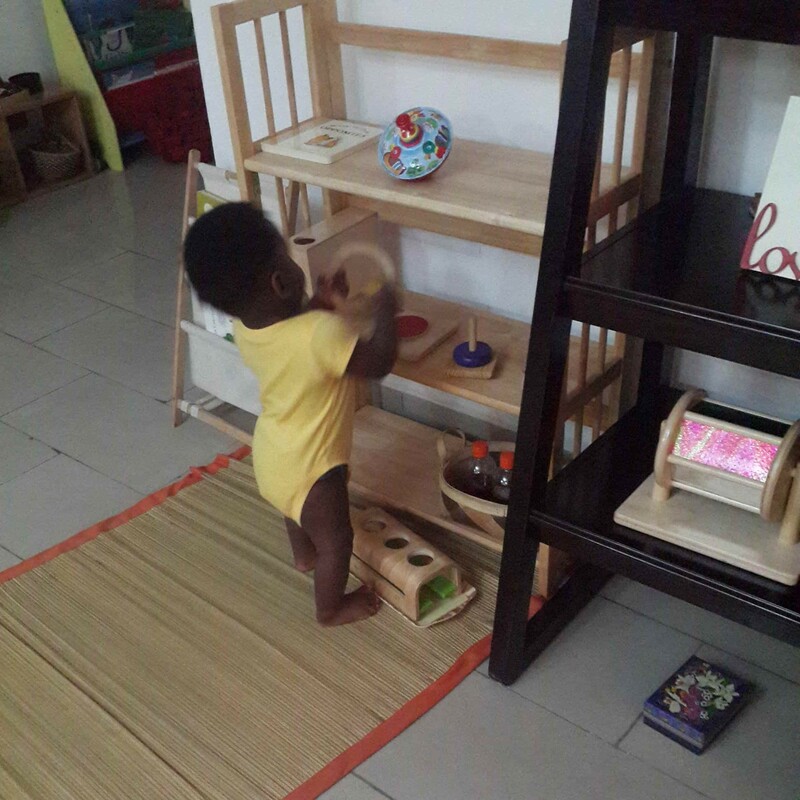 He figured out how to lean forward and support his weight on the shelf so that his hands would be free to work. He even figured out how to sit and crawl through the shelf. Lol! During a visit from a little friend who could stand, he tried to stand and actually succeeded for a few seconds. This told me he could stand. But why wasn’t he standing on his own? He had been pulling up and cruising for over two months. I observed him and noticed he spent most of his time by his shelf or table and usually leaned forward to work on the shelf so he really did not need to stand. By this time, he was 8 months old, and we were spending most of his awake time in the living room so I also felt he needed more materials available to him there. I decided to change his shelf to a higher one that did could hold more materials and which he could not lean on. He wasted no time in coming to his new shelf to work. … and that afternoon this happened! 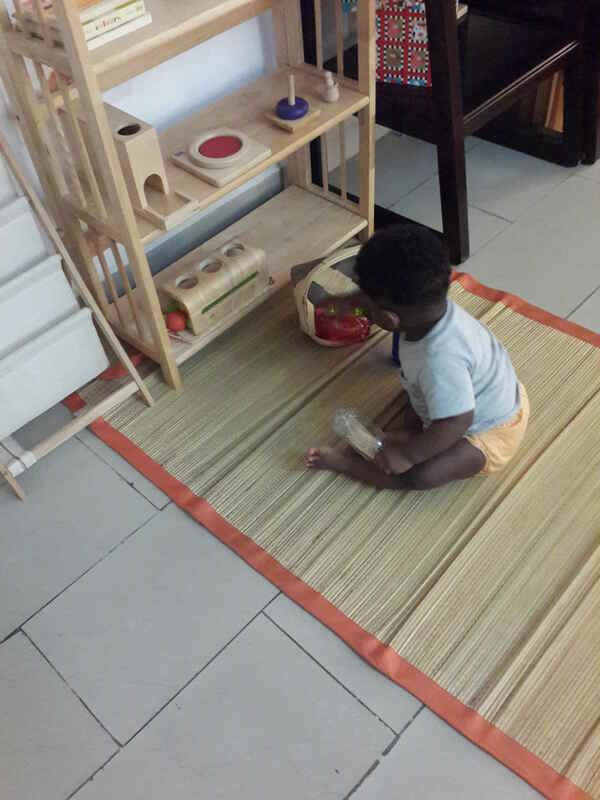 More than supporting his motor development, we love the independence his shelves give him. Since that first time he slithered to his shelf at 5 months, he has been able to crawl to his shelf to play, sometimes for up to an hour, only coming to us when he needs something. I also love that it is so easy to clean up when he is done. I love how organized it makes his toys. I love that he has his own space in our living area. I hope it gives him the message that he is an important member of our home and that we respect him. He is taking a few steps now. Once he is walking comfortably, I will take away the mat that is by the shelf and show him how to carry a toy to his table or to a mat and return it to the shelf when done. 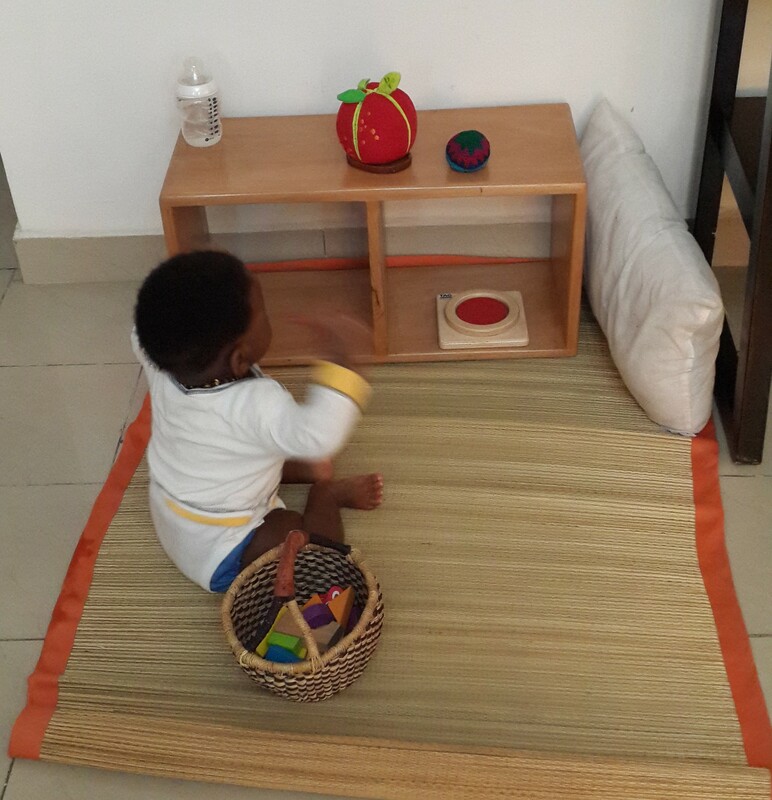 Regardless of how old your child is and especially if they are in the 0 to 12 age range and even more importantly if they are in the 0 to 6 age range, I highly recommend having their play or work items arranged on a shelf. I would love to answer any questions and support you in making this change to your child’s area so feel free to leave a comment or send a message with any questions or comments. I included a lot of pictures because a lot of times when I read blogs or articles, I get ideas from the pictures that the author may not have mentioned. Thank you so much for writing this. Full of useful information and very inspiring. I’m pregnant with my 3rd child, but I’m new to the Montessori method, so I’m trying to figure out how to organize the spaces for my new baby, and how to re-arrange them according to her emerging needs while she grows. Keep up recording, please! Your pictures are also awesome. Would love to know where your baby furniture comes from. The shelves and the mini table and chair. Or ideas of where we could get ours.